LONDON: Pakistan High Commissioner Mohammad Nafees Zakaria has said that Pakistan is facing challenges on both internal and external fronts but meeting them tactfully with great success. 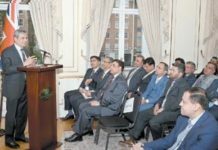 “Overall law & order situation in Pakistan has improved a lot which is boosting international confidence and investment”, he said while addressing the first annual meeting of Quetta Association, a body of British alumni of Command and Staff College Quetta, held at the High Commission here on Wednesday (27th March). The High Commissioner hosted the gathering which was attended by Maj Gen (Retired) Seumas Kerr, Chairman Quetta Association, Lt Col Alan Whitelaw, Secretary Quetta Association, Lt Gen Retired Sir Alistiar Irwin, former President Quetta Association, along with 40 British graduates of the College and their spouses. Since its inception, this was the first meeting of the Quetta Association which was organised at the High Commission, London. The High Commissioner in his speech hoped that the platform of Quetta Association would further strengthen the existing links between not just the Armed Forces of the two countries but also historical links in diverse fields. He said that presence of a large number of former British graduates of Command & Staff College Quetta was a strong pillar of support for the ties. Mr. Zakaria highlighted that the global economic gravity had shifted to Asia. Pakistan, by virtue of important geographic location in the region was in an advantageous position. He informed the officers that the present government was pursuing prudent economic policies, which will benefit the UK, among others, who may join hands. Democratic continuity, strengthening of the institutions and conducive environment have played a key role in the turnaround of the country’s profile. “This was reflected in the increased investor’s confidence, as more and more foreign companies were showing keenness to invest in Pakistan. 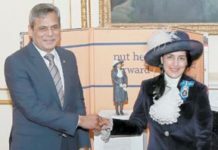 In the backdrop of Brexit, he underlined that there existed numerous opportunities for the UK and Pakitan, to augment economic ties between the two countries”, he added. 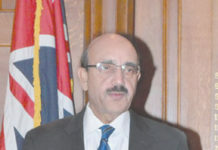 Condemning the recent dastardly acts of terrorism in New Zealand, the High Commissioner said that terrorism had no religion and urged on the necessity of joint efforts by the world to curb this menace. He expressed solidarity with the families of the victims of the attacks, appreciated New Zealand Government’s handling of the situation in the aftermath and paid tribute to those who had sacrificed their lives in the fight against terrorism while protecting the humanity. Maj Gen (Retired) Seumas Kerr, Chairman of Quetta Association, in his remarks, highlighted the importance of the forum for both UK and Pakistan as it provided a vehicle for sharing the common traditions and experiences of Armies of the two countries. On the occasion, Commodore Jamal Alam, Defence Adviser at the High Commission, read the message of Commandant Staff College Quetta to the audience. The message reiterated that continued participation of British Officers was a testament of the age old affiliation between Command and Staff College, Quetta and the UK. Quetta Association UK was playing a pivotal role in this regard by ensuring that this mutually beneficial relationship is continued.